ICE Trigonometry nodes: degrees or radians? The docs don’t say whether the Trigonometry nodes like Cos and Sin work with degrees or radians, so you have to figure it out yourself. Fortunately, that’s pretty easy to do. You just check which of these returns -1: cos( 180 ) or cos( π) ? I went a little overboard, but this shows that Cos and Sin expect angular measurements expressed in degrees. 2*π radians is equivalent to 360 degrees, so π is 180 degrees. 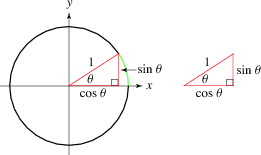 cos( θ ) is the X coordinate of a point on the unit circle, so we know that at 180 degrees (or π if using radians), Cos will return -1. 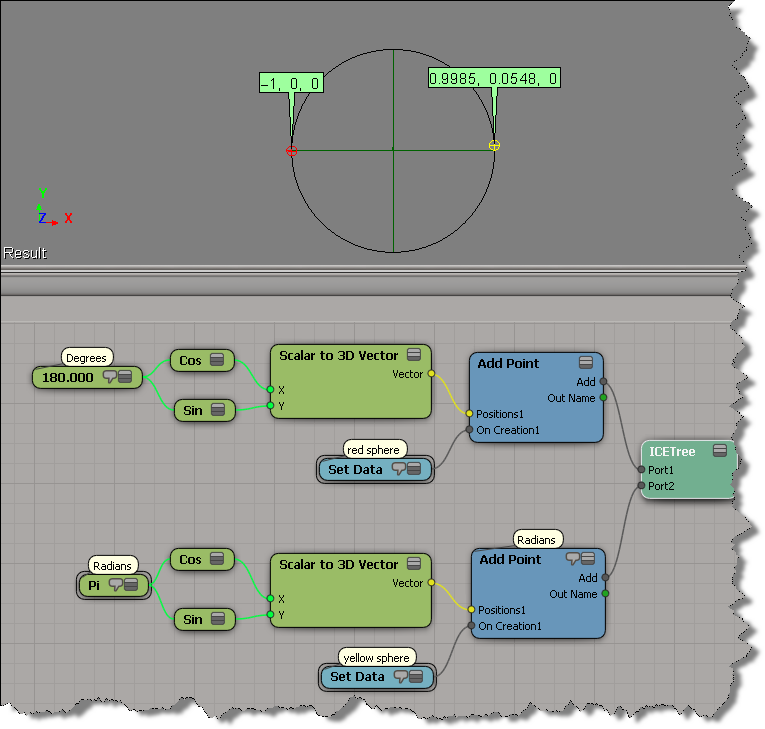 This entry was posted in 3D Math, ICE and tagged Cos, ICE, Sin, Softimage, Trigonometry by xsisupport. Bookmark the permalink. Agreed. This is one of the things that I would like amended in the ICE reference document, to provide information on the various input port, the type of input allowed, the format (degrees vs radians) and range -10000 to + 10000, etc. Other part of the SDK provide this but the ICe Reference section needs some love! Good work, keep it comming!